It was strange how we felt compelled to enter and to look. There are sixteen of us that have been drawn through the doors together. Eight couples, although not in the usual sense of the term for some of them. There is a mother and son for instance; a father and daughter too. It’s hard to know what the draw was, as none of us seem to know quite what to expect. There’s no clue as to what we’ll find inside those doors from any posters or advertisements. Entry is free so maybe it’s nothing more than a mutually shared desire to kill time. There’s a tiny dim corridor that leads straight down to a gallery, a large room anyway. I walk along next to my fiance, Kevin; we seem to be leading the way. The room is large, light, and almost empty. A long bench stretches across the room, facing the only piece of art that I can see. All the other walls are bare, but this piece....well, it’s massive. As a group we walk around to the front of the beach and take a seat, preparing to study the picture. Part of a woman’s face, a hand held up covering her mouth. The longer we look, the creepier the picture becomes. Maybe it’s something to do with how little of her face is in view; just one eye, mouth hidden. She looks scared, terrified by what she is seeing; and at the same time she seems to be looking straight at us. A door bangs in the distance. It makes us all jump, and then we share a laugh about how crazily nervous it’s made us become, this picture that is gazing out at us. Perhaps it would be better if we all got up and went now, carried on with whatever we have planned. And yet not one of us makes an effort to stand up. It’s not until the door to the gallery itself slams shut that we think maybe she was warning us. It was a warning that went unheeded though. I’d like to say the lights went out, but they didn’t; no, the shadows grew, accompanied by some deep rumbling growls. Something was in the room with us, or maybe some things. We looked to each other, panicked now. Our faces mirrored the one on the wall. Something leaped up, grabbed and bit and someone screamed. We all screamed, tried to get out, but the door was locked and these goblin things were hungry, out for blood. I got to the door, banged on it with my fists and screamed. Surely someone from the street would hear. That first bang! It must have been the outside door shutting us in and cutting us off. There is a tearing, a ripping, from the back of my leg and the pain brings me down to the ground. Scaly, grey, about three feet high and with claws a cross between blades and talons. The teeth, when it opens its mouth, pointed, sharp, bits of flesh and muscle still hanging in thin strips between its teeth. What’s left of my leg, no doubt. And now it’s reptilian eyes are fixed to my own. The scream wells up from deep inside me, makes it’s way up and out of my throat, just as the creature flings itself forward to rip and to tear at my neck. I'd not planned on writing this one today at all, Mike, but it popped up so I just went with it. Thanks for giving it a read. Oh how frightening, Hully! Such a clever story. Great story, Hully! Goblins are a highly underrated creature, but you do them justice here. Love how innocently the story starts, then forms into a mystery as they stare at the painting, then becomes a thriller as the first door slams before turning into all out horror. You do a great job of curtailing various cliches - keeping the lights on, using multiple people who both know each other and are also strangers, using an art gallery, goblins instead of the usual ghouls or ghosts. A lot of original elements at play. The story also does the cover pic justice! After reading the story and looking at the painting again, it is creepier. The description of the goblin with bits of muscle and flesh hanging from its teeth is excellent! What a great image! This story definitely suggests a more graphic scene than what you usually write, however, aside from that one description, the violence is left to the reader's imagination. Thanks, Jeff. As you guessed this was very much prompted by the cover pic. 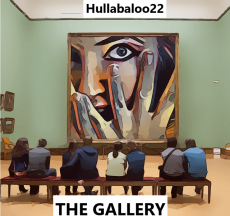 I thought it was a creepy picture and then decided to turn it around to make the picture the observer instead of the visitors to the gallery. I'm really glad you enjoyed the read. Those dratted goblins are always gobblin' something ... or someone. Excellent description, Hully. Thanks, Joe. Goblins, gremlins -- there's a lot of them about. A great interpretation of the picture prompt, Hully. As always, a gripping read as the tension and suspense develops. Well done! Thank you, Sue. I quite enjoyed writing this one!